This church has captivated me since I was a little girl. 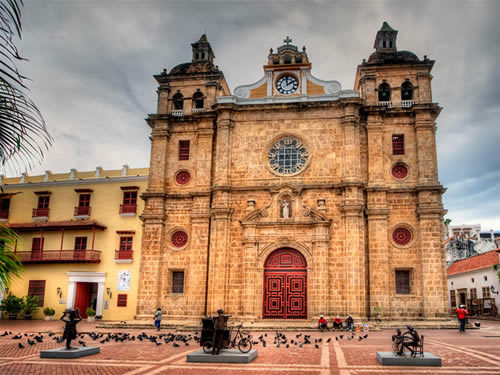 It was hard enough to get a reservation, date and time set with any church in Cartagena.I called all the churches, emailed, asked people who knew someone in Cartagena to go to the church and even then it was just difficult. The churches either have an open agenda or they dont, and when they open even if you have been calling or emailing for a year, they still dont care and only place a reservation with $ as a first come first serve basis. 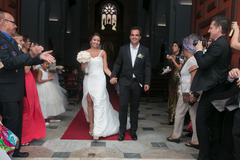 I was unlucky for quite a while, until my grandpa paid a flight for a priest who she is friends with to go to Cartagena and find us a venue. Upon his arrival, they told the priest how much it would cost, and he put down a deposit so that we could hold the reservation. When I finally went to pay the other half they told me the prices went up and we had to pay the extra cost. I really think there should be some type of contract, so that this never happens. Its not like you get AC or anything spectacular. But the fact that you budget according to the first deposit you make and then hear that its gone up just because someone there doesnt want to be fair is just sad. On top of that we reserved our time for rehearsal and we had another group on top of us the entire time. 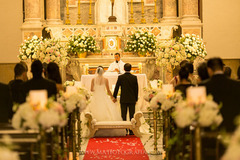 To tell you that at the time my ceremony was ending, and I was taking pictures in the altar, they started changing my flowers for the next wedding. My guests and I were very upset about this. I felt rushed, I was upset and over all it doesnt make sense to rush people our of their own ceremony. It left a bad taste in my mouth. Someone should really coordinate weddings at churches, and be on top of these issues. Beautiful church! The staff was friendly and helpful, Carmen the secretary helped us find a bilingual priest, since my husband doesn't speak much Spanish. It was a beautiful ceremony! Despite of the time confusion, they told us 7pm, the ceremony didn't start until 730pm.